Doctor Who season 11 hit the ground running with a new Doctor—Jodie Whittaker, the first woman to ever step into on the role—new companions, and new showrunner Chris Chibnall. Here, in addition to a full review of the premiere, The A.V. Club weighs in on Whittaker’s (and the season’s) auspicious debut. Danette Chavez: In terms of its plotting and editing, “The Woman Who Fell To Earth” is only a so-so episode of Doctor Who, but it’s a great showcase for Jodie Whittaker as the Thirteenth Doctor. I don’t really mind that the more far-out stuff like the alien invader took a backseat to the smaller moments between Thirteen and her companions. But I could see where Grace’s (Sharon D. Clarke) storyline was going from the moment her husband Graham (Bradley Walsh) grumbled about being kept at arm’s distance by his stepgrandson Ryan (Tosin Cole). And the Predator-lite foe who menaces the quintet turned quartet vaguely recalls a Cyberman in his armored form, but will otherwise be nearly impossible to remember after this week. Thankfully, Whittaker imbues the episode with enough intelligence, madcap energy, and goodheartedness that keeps things moving when there isn’t a proper transition between scenes. There’s no doubt she’ll make the role her own in due time, but Whittaker wisely nods to her predecessors (specifically, David Tennant and Matt Smith) in her early performance. The scene in which she builds her own sonic screwdriver (or “Swiss army knife”) allows for familiar facets of the Doctor to shine through, so even if Thirteen spends most of the episode struggling with amnesia, we always know exactly who she is. 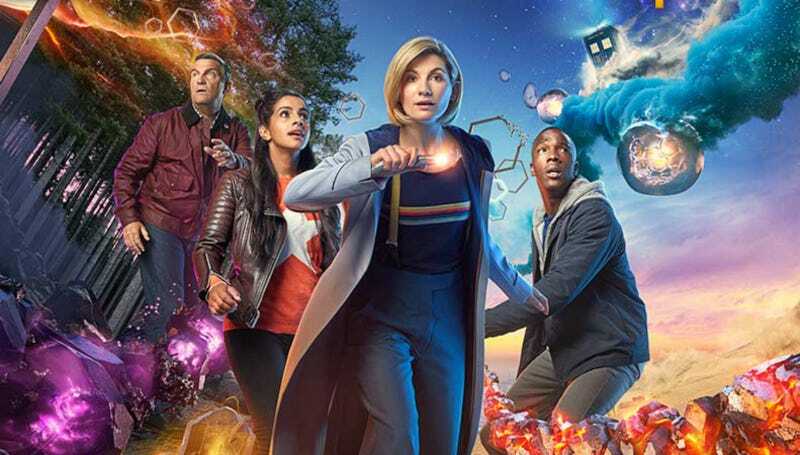 Alasdair Wilkins: Whatever Doctor Who is going to be with Jodie Whittaker in the TARDIS and Chris Chibnall in the head writer’s chair, it doesn’t come into focus in their debut outing. Good. Tasked with introducing four new characters—not to mention the show’s general premise for anyone joining now, which, welcome to any and all newcomers, this should be fun—this first episode is exciting more for what it promises than what it delivers, which is basically your standard Doctor Who adventure with a bit of a daft villain. The shift in emphasis from a single companion to a whole team for the Doctor detonates a core part of the new series formula Russell T. Davies established and Steven Moffat never entirely strayed from. There’s echoes of Chibnall’s Broadchurch in everything from the propulsive sound design to the development of Sheffield as a character in its own right. Then there’s the show’s new star: From the moment she plummets onscreen accompanied by a sting of the opening theme, Whittaker is the Doctor, at home as both idealistic hero and alien weirdo. What will set apart her specific incarnation is something the rest of her tenure will answer. It’s going to be fun finding out. Allison Shoemaker: What I most enjoyed about “The Woman Who Fell To Earth,” beyond the thrilling, magnetic presence of Jodie Whittaker, were several scenes that instantly felt like classic Doctor Who moments, while still doing something new. A mysterious force stalks passengers on a dark train car, delightfully familiar; one of them (and only one of them) has zero interest finding out exactly what’s going on, deliciously new. The Doctor, mid-regeneration, finds herself without TARDIS, sonic, or much of an idea of who she is, a bit of a tradition; she grabs some spoons and forges a new sonic “Swiss army knife” herself, a surprising marvel of a scene. That’s all I really want from a regeneration episode—plenty of connective tissue linking this new Gallifreyan face to the rich history of those who preceded her, and a powerful undercurrent of energy that speaks of endless potential. In that respect, and in many others—notably three companions I like a lot, and one fallen companion I hope returns in some timey-wimey way—this is a solid, promising premiere. It looks great. It sounds great (digging the new theme). It’s brilliantly cast. But a lot of those elements could have been a lot shakier and I’d still have come out of it excited. Watching the Doctor, and this Doctor in particular, realize she’s sonic-less before deciding to build one with her own two hands and two hearts was a hell of an experience. I can’t wait to see what she does next. Baraka Kaseko: I’ll get the stuff I didn’t like out of the way first. Like Caroline Siede said in her excellent recap, the central mystery and villain of “The Woman Who Fell To Earth,” was incredibly underwhelming. Sure, the image of “Tim Shaw” removing his mask to reveal a face covered in the teeth of his fallen victims will forever fuel my nightmares, but I doubt he’ll be remembered in the pantheon of great Doctor Who villains. Moreover, the suggestion of two warring species using Earth as a battleground is far more interesting to me, and I wish the writers would’ve explored that idea. But none of that really mattered because, as a regeneration episode, “The Woman Who Fell To Earth” was a coming out party for Jodie Whittaker’s Doctor. She’s funny, endearing, and engaging in the role, and just a goddamn delight. I also appreciate the dynamic the writers have established between Thirteen and her companions—it’s clear she values their contributions and holds them to a high standard and I’m excited to see their relationship grow over the course of Whittaker’s tenure.